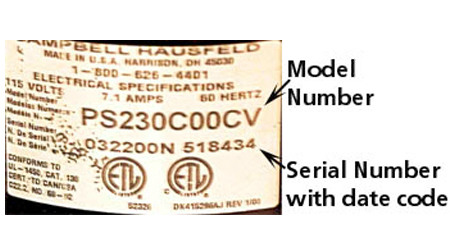 If you need to find your Campbell Hausfeld model number and serial number, we can help! 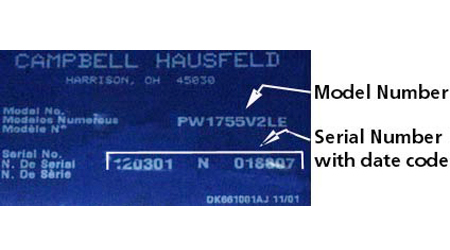 Find your Campbell Hausfeld equipment below to see model and serial number locations. The Campbell Hausfeld air compressor model number and serial number are located on a sticker on the tank of your machine. The date code is incorporated into the serial number and is read as 03/15/2001. Look up your Campbell Hausfeld air compressor parts. The model name is located on a plate on your air tool. 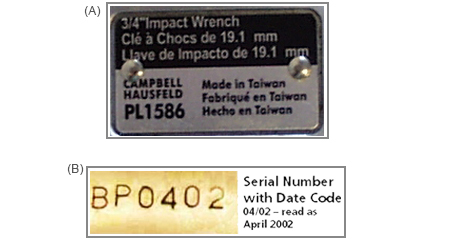 The serial number is located on your air tool with the date code included. The date code, 4/02, is read as April 2002. Look up your Campbell Hausfeld Air Tools. The model number and serial number are located on your air tool. The date code is included in your serial number. The date code is read 3/22/2000. Look up your Campbell Hausfeld Paint Systems. Campbell Hausfeld pressure washers have the model number and serial number located on the pressure washer. 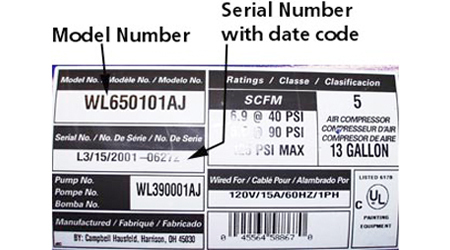 The date code is included in the serial number and is read as 12/03/2001. Look up your Campbell Hausfeld pressure washer parts. 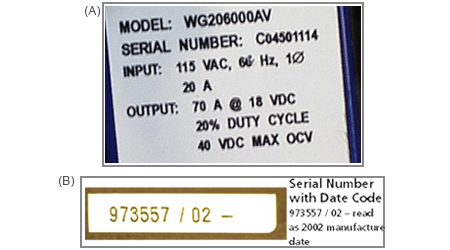 The model number and serial number are located on a sticker on your equipment. On some of the Campbell Hausfeld Welders you will find the date code incorporated with the serial number. The date code is read as 2002 manufacturer date. Look up your Campbell Hausfeld welder parts.